Cumbria Chamber of Commerce (“the Chamber”) understands that the information you trust us with is important to you, and we are committed to protecting that information and respecting your privacy. As part of this we are fully committed to complying with the provisions of all applicable Data Protection legislation and regulations such as Data Protection Act and EU GDPR. This Policy is effective as of 1st May 2018. It will be continuously assessed against new technologies, business practices, regulatory changes and the evolving needs of the Chamber and the services provided the Chamber. The policy covers all brands and activities operated by the Chamber, including, but not limited to, Cumbria Chamber of Commerce, Made in Cumbria and Cumbria Business Growth Hub. We are registered with the Information Commissioners Office, the UK’s Data Protection Authority. We need to collect information about you to offer and deliver our range of services. This can include personal information about you and others in your organisation. Primarily this is information we collect directly from you, some automatically. Some may be from other sources. The Chamber does not collect personal data about individuals except where there is a legitimate business requirement or when such information is provided on a voluntary basis. We collect and use your personal data to give you information in relation to Chamber membership, the Chamber’s websites and other Chamber services (including delivery of business support initiatives); to deliver Chamber membership services to you if your organisation is a Chamber member; to deliver business support to you where your organisation has signed up to a business support initiative run by the Chamber; to deliver other Chamber services such as events; customer administration; prospecting new members and clients; account management with existing members and clients; to process and respond to queries received from the public or other relevant stakeholders; to contact you to seek your views or comments on emerging political or economic issues; to undertake research and analysis; to protect us and you from fraud; to improve the services we offer; to report to funders; and to inform you of other services that may interest you. The personal data held by the Chamber may also be used on an aggregate basis without any personal identifiers to provide third parties with information, such as the composition of membership; to help us develop services, improve the features and content of our websites or other communications; and to provide sponsors and others with aggregate information about our members, clients, online communication users and their usage patterns in relation to services. Performance of a contract – the use of your information is necessary to perform a contract that you have with us. Legitimate interest – we may use your information for our legitimate interests such as to provide you with the most suitable support, website experience, emails or newsletters, or to improve and promote relevant business services, along with administrative, fraud prevention and detection and legal purposes. Consent – we may rely on your consent to use your personal information for certain services or for direct marketing purposes. You may withdraw your consent at any time. Please use the opt-out at the bottom of our emails or contact us using the details provided at the end of this policy. If your business or the business you work for is a current member of Cumbria Chamber, opting out of promotional emails will not stop all communication from us. By becoming a member of the Chamber your business is signing you up to receive certain information related to the organisation. It is a constitutional requirement for us to send this information to you. If you, your business or the business you work for is signed up to a current business support project run by Cumbria Chamber/Cumbria Business Growth Hub, opting out of promotional emails will not stop all communication from us. By signing up to the project your business is signing you up to receive certain information as part of delivering that project. If you, your business or the business you work for is not a member of the Chamber or signed up to a current business support contract you can choose to opt in or out of further contact with us. We also receive non-member data through networking (e.g. business cards, event registrations) and add these details, if relevant, onto our CRM or other data management system. We may on occasion purchase ‘opt-in’ data (lists from reputable providers) for promotional campaigns. We may have to share your information with trusted third party service providers, partners and/or funders in certain circumstances. We do not sell your personal information to third parties. The personal data collected is stored in one or more of the Chamber’s CRM systems and other appropriate data management systems, both paper based and electronic. The Chamber and the information we collect about you is subject to various regulatory, legislative and contractual requirements. We will endeavour not to keep your personal information for longer than we have to for us to fulfil our obligations to you and funders and legal/regulatory authorities. Where it is not possible for us to delete your data we will ensure appropriate security and organisational measures are in place to protect your data. We work hard to keep your data safe. 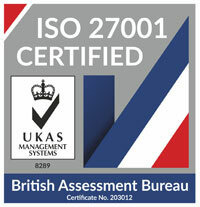 The Chamber is ISO27001 accredited throughout the organisation and its activities. We use an appropriate combination of technical and organisational measures to ensure, as far as reasonably possible, the confidentiality, integrity and availability of your information at all times. We have put in place appropriate security measures to prevent your personal data from being accidentally lost, used or accessed in an unauthorised way, altered or disclosed. If you have a security concern please contact us using the contact details at the end of this policy. We limit access to your personal data to only those employees, contractors or agents and funders who have a legitimate business need to have access to that data. They will be subject to a duty of confidentiality and due care with respect to handling the personal data. The use of these cookies helps us understand how you use our websites, view our services and respond to our communications activity, so we can tailor communications and enhance our service offering to you. When you visit one of our websites we may record your device information, including IP address, hardware and software used, general location and when and how you interact with our websites. This information is retained and used to note your interest in our services and improve your experience. When you receive communications emails from us we may use technology or links to determine how you use our direct communications and your interest in it. The Chamber is a membership and business support delivery organisation and for its legitimate business interests, must maintain contact information on its members, clients and the wider business community to communicate information on membership, support services, events, training courses, policy and research, international trade and any other Chamber products or services. The Chamber also sends communications promoting its events, training courses, membership services, business support services, policy and research work and other relevant offerings. From time to time we collaborate with other relevant organisations to highlight other programmes that may be of interest to members, business support clients and the wider business community. We distribute the organisation’s information on their behalf to those who may legitimately benefit from or have elected to receive such information. We do not provide these organisations with any personally identifiable information. If you do not wish to receive marketing material, you may opt out. Every marketing e-mail will include an ‘unsubscribe’ link at the bottom. You may also notify the Chamber in writing as set out below. If you have elected or been nominated by the business you work for to be a relevant contact required to receive information on its behalf, you cannot opt out of important information the Chamber is required to provide you as per the Chamber’s contractual obligations to its members and business support clients. You have the right to request a copy of the information we hold about you. We will provide this information within one month of receiving your request, made in writing to the contact details at the end of this policy, and verifying your identity. You have the right to contact us if you believe your personal information is incorrect, or if you believe we are no longer entitled to use your personal data. If you have any questions about how we use your personal information, please contact us using the details at the end of this policy. We may use third party provided tools to manage our social media interactions. If you send us a private or direct message via social media the message may be stored by these tools. Like other personal data, these direct messages will not be shared with any other organisations. The Chamber is part of a network of 53 Chambers of Commerce across the UK accredited by the British Chambers of Commerce (BCC). One purpose of the Chamber is to “influence the function of …any governmental body”. This objective is stated in the Chamber’s ‘Articles of Association’ . We will provide BCC with your company’s email address in order for BCC to conduct research into the impact of policies on your business. We work hard to ensure your personal information is treated safely and securely. However if you have a complaint please write to us using the contact details at the end of this policy. You also have the right to complain to the Information Commissioner’s Office. Cumbria Chamber of Commerce and Industry Ltd controls the processing of personal data on its systems. If you would like to discuss anything in relation to this policy or how we handle your personal information please write to Rob Johnston, Chief Executive, Cumbria Chamber of Commerce, Broadacre House, 16-20 Lowther Street, Carlisle, CA3 8DA or email rob@cumbriachamber.co.uk. Please note that because of regulatory, legislative or contractual requirements it may not be possible for us to delete your data. If you have further concerns about how we use your personal data, you also have the right to make a complaint at any time to the Information Commissioner’s Office (ICO), the data protection authority for the UK. Please visit https://ico.org.uk/ for more details on your data protection rights and how to contact them. We may use both ‘session’ cookies and ‘persistent’ cookies on the website. We will use the session cookies to keep track of you whilst you navigate the website. We will use the persistent cookies to enable our website to recognise you when you revisit. Session cookies will normally be deleted from your computer when you close your browser. Persistent cookies will remain stored on your computer until deleted, or until they reach a specified expiry date. We use Google AdWords, Facebook, Twitter and LinkedIn remarketing to enable us to deliver targeted adverts across 3rd party web and social media channels. The cookies used do not in any way identify you, your personal information or give us any access to your computer. This allows us to tailor our marketing to better suit your needs and only display ads that are relevant to you. Most browsers allow you to refuse to accept cookies. This will, however, have a negative impact upon the usability of many websites, including this one. Therefore, please ensure cookies are turned on in your browser.